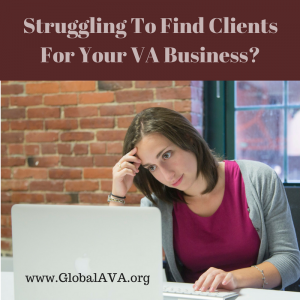 Are you looking for Virtual Assistant clients and coming up empty? The first thing I would ask is where (exactly) are you looking for them? I come across this problem often – and VAs tell me they are looking ‘everywhere’. I’m here to tell you that ‘everywhere’ is the wrong answer if you are asking yourself that question. When you are in business, you always need to be on the lookout for prospective clients. That’s a given! But looking 'everywhere' is a waste of time and not the same thing at all. Have you ever said any of those things … or anything like them? I have. I know exactly what it feels like to think those things. All three of them as a matter of fact. But do you know what the problem was? ME! If you are networking all day long and can’t find good prospective clients, you are looking in the wrong places. If you are spending all of your time looking for clients but you don’t have any, you are not connecting in the right way. If you are ready to give up because the people you are in contact with are cheap, you are speaking with the wrong people. New VAs often lack the ability to network and market their business properly. It is so worth getting some training or guidance on this part of your business. It will save you so much time when you know how to do it right! Where are you looking? If you are constantly coming up empty, you could be looking in the wrong place. The best plan is to determine who you can best support, and then figure out where they are and go there to connect with them. In the marketing world this is called finding where they ‘hang out’. Why? Because they are being themselves. They are asking for help or getting advice from colleagues and others in a public forum, whether that’s online or offline. Look in the right places and you’ll find better prospects, guaranteed. Are you actually connecting with people when you are ‘out and about’? If you are a lurker who is waiting for someone to come up and ask you if you want to help them, you will not get clients. You must speak and actually connect with them. You have to learn the art of conversation – and practice it – a lot. It's really just simple math - the more people you talk to, the more clients you will get. When you have conversations with people about how you can help them, you develop really good skills in this area. Do more of what works for you, and do less of what doesn’t. Are you even speaking to the right people? If you find yourself educating people about what a VA is, you have your work cut out for you. I would cut bait and run from a group like that. It’s too much effort. You have to find industries that are already working with VAs so all you have to talk to them about is specifically how you can help them. Trust me on this one, you will see success much faster when you do this. I spent years trying to let people know how great hiring a VA was and I suffered low income as a result. I know what I speak of here! Focus on a great market that already uses Virtual Assistants. Correct these mistakes and you'll get clients. Getting clients – good clients – takes strategy and action. If you know what you are doing wrong, take steps to correct it. You can actually find clients by networking for just 15 minutes a day, if you are talking to right people, in the right place, and saying the right things. If you need some help putting this into action, I invite you to watch this free training I did through Your VA Mentor: Goal Setting to Get Clients.